This week I was hosted by Pellet Fuels Institute board chairman Don Wagner from Appalachian Wood Pellets and together we spent three days traveling through West Virginia, Pennsylvania and western New York. The trip was planned to serve two purposes. First, Don wanted to expand my understanding of the country’s hardwood industry and how much the health of that industry impacts pellet production in the region. Second, the trip was a member recruitment effort with us visiting three different producers in the area who have either never been members of the PFI or have had their memberships lapse. We spent the majority of the first evening and the next day the Appalachian Wood Pellets facility in Kingwood, West Virginia. The plant is co-located with one of the nine Allegheny Wood Products sawmills that convert poplar, red oak, and other hardwoods into lumber and dimensional stock for sale in domestic and international markets. The team at Appalachian Wood Pellets welcomed me to West Virginia with a pellet grilled dinner and I spent the night learning about the plant and its team certainly, but also about the impact that Chinese tariffs are having on their hardwood business. Exports markets are extremely important to hardwood product manufacturers. While at one-time furniture manufacturing in the region was strong, offering ample opportunity for domestic sales, that manufacturing has now moved overseas and with it the demand for Appalachian hardwoods. Tom Plaugher, the vice president of operations for Allegheny Wood Products, walked me through the situation that hardwood producers now find themselves in with one of their most important foreign customers. Anyone following global trade over the last year knows that a major initiative from the Trump Administration is to reset the balance of trade with our trade partners. In response to tariffs introduced on inbound steel and aluminum from China, the Chinese government placed retaliatory tariffs on a whole host of American products including hardwoods. Plaugher explained to me that the impact on Allegheny Wood Products was felt literally overnight. Quite simply demand lumber products and even containers of whole logs fell off precipitously and hardwood producers are scrambling to adjust to this shock through the marketplace. Timber prices are down and stumpage rates are following. While the market turndown hasn’t yet impacted the ability of Appalachian Wood Pellets to run at the capacity it wants to, Plaugher wondered aloud how long it would be before the challenges he feels from the Chinese tariffs were felt by either the team at Appalachian Wood Pellets or other pellet producers in the area who rely on a steady stream of residuals from hardwood sawmills. Our member recruitment efforts took us into the facilities of three different producers in the region and as of press time, the outcome of our efforts is not yet known. 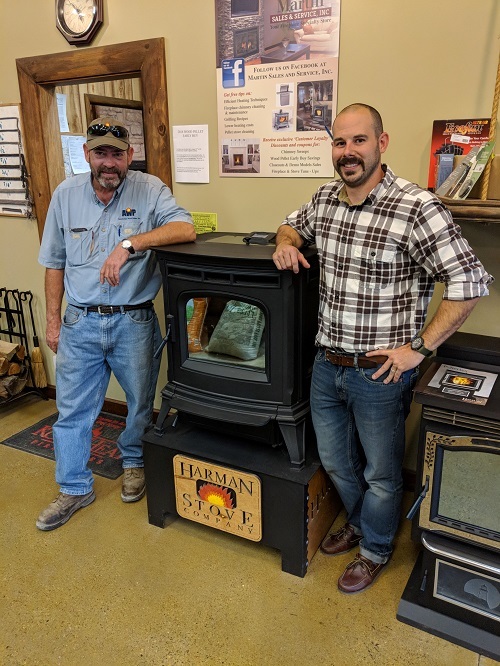 Don Wagner of Appalachian Wood Pellets and Chair of PFI’s Board of Directors, poses with Adam Martin of pellet stove retailer Martin Sales & Service. As an added bonus we were able to stop by and talk to Adam Martin from Martin Sales & Service, a specialty hearth retailer in Butler, Pennsylvania. Martin was the first participant in our ongoing social media beta test and we spent a great deal of time talking to him about his business, the impact he feels the social media efforts are having on his business and some ideas on how the program can be expanded and improved. While we’ve felt this for some time, Don and I both walked away feeling strongly about the need for a greater retailer presence not only within the PFI’s membership but also on the board. If we’re going to have any real chance at achieving our stated goals in Operation 100k, the voices and experience of hearth retailers must be a part of our conversations. We're building a collection of photos of our members, their pellets mills and product. Send them to Carrie Annand at [email protected]. 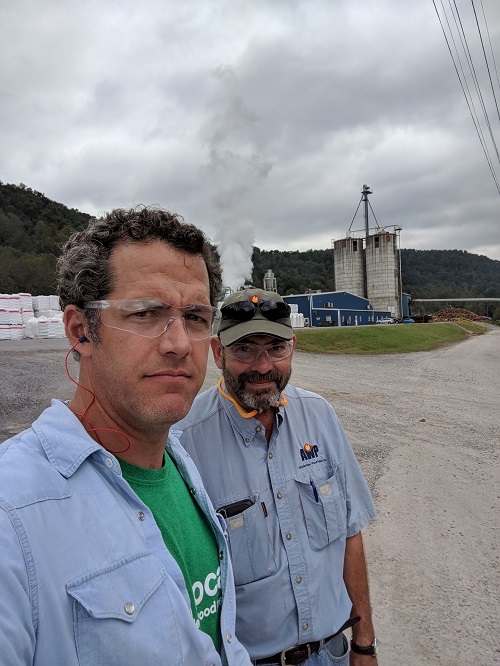 This week’s featured photo shows Tim Portz getting a tour of Appalachian Wood Pellets by Don Wagner. Are you a PFI member, pellet manufacturer, or distributor that has fuel available? Email [email protected]elletheat.org to have your listing updated or added to the PFI website. This heating season, the Pellet Fuels Institute is launching a social media beta test in selected markets across the country in an effort to increase consumer awareness of wood pellets as an option for residential heat. This effort is the PFI’s first salvo in a broader initiative geared toward increasing the frequency of consumers selecting a pellet-burning appliance when choosing a new heating option for their home, outbuildings, barns or businesses. Sometimes, nice old buildings present fertile opportunities for renewable heating makeovers with wood pellet boilers. A great example is a 30,000-square-foot office and warehouse that was built over time, starting in 1965, by New Hampshire Gov. Meldrim Thomson for his Equity Publishing business. As Gov. Thomson's business grew from the core 1965 building, each building addition received another heating system. When Tarm Biomass moved into the building almost two decades after the Thomson Family owned it, there were six separate heating systems. The original, blackened, American Standard oil boiler with its 6-inch stalactite pipe leaks remained in place. Three propane-fired, rooftop units redundantly heated office space that was also heated by the oil boiler. An oil-fired furnace array hung from the ceiling of the 1986 high-cube warehouse. There was also an oil furnace—we'll call it Frankenstein—heating another 10,000 square feet. Based on oil stains and soot coatings, Frankenstein appeared to be at least 40 years old. Fred Robles was named the 2017 World Barbecue Champion. But in a state where mesquite, oak, and pecan form the barbecue wood trinity, this Weslaco resident won’t apologize for his gadgety cooker: When it’s time to cook his prized pork, he’s usually doing it with pellets. He said the consistency, coloring, and flavor his Traeger grill infuses into the meat gives the Texas staple traditional off-set steel smoker a serious run for its money. In fact, he finds his pellet grill superior for some cooking.